Pervasive on the internet these days are night sky images with unnatural color, often produced by artifacts caused by bad post processing methodology, and often taught by professional photographers. Here is a description of the problem, why it happens, and how to verify if your images have the problem or show natural colors. From the first part of the series (3a, 3b, 3c), I have shown how we know, with good precision, the color of stars, nebulae, aurora, and other objects in the night sky. Unfortunately, it appears that in the digital photography era, some photographers have been teaching methodologies that produce images with unnatural colors and even varying color balance with scene intensity. The technical reason is they do not seem to know the basics of image processing, when one should subtract and when one should multiply, and/or they don't understand the tools they are teaching with and whether or not those tools are doing a multiply or add/subtract. This is quite unfortunate as better methods are easily applied to night sky images that not only produce natural color, it brings out amazing and beautiful colors in the night sky. In this article, I'll show and describe why this problem happens, and how to check your own images to verify color in your night sky images. A natural color image of the Milky Way galactic core region is shown in Figure 1. The brownish-red color is from cool (orange and red) stars and reddish-brown interstellar dust. 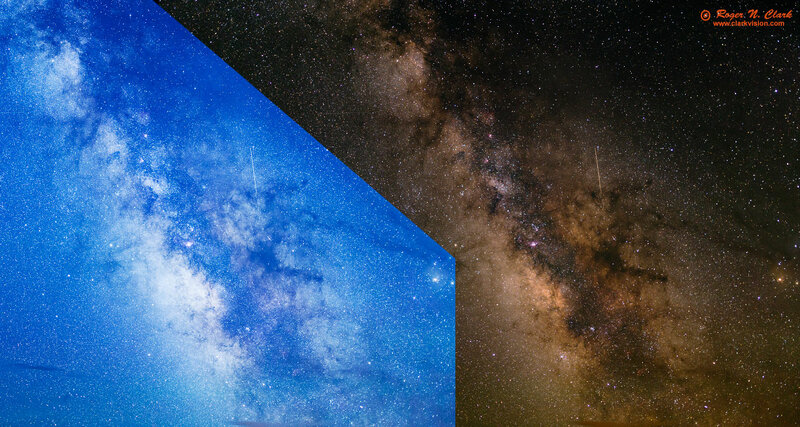 As one moves out of the plane of the galaxy (left and right from the bright Milky Way in Figure 1) the color does not change to the commonly seen blue in Milky Way images seen on the internet. In fact, the color actually gets slightler redder. We know this from stellar photometry. The blue seen in in Milky Way images online are artifacts created in post processing--fake colors. Figure 1. 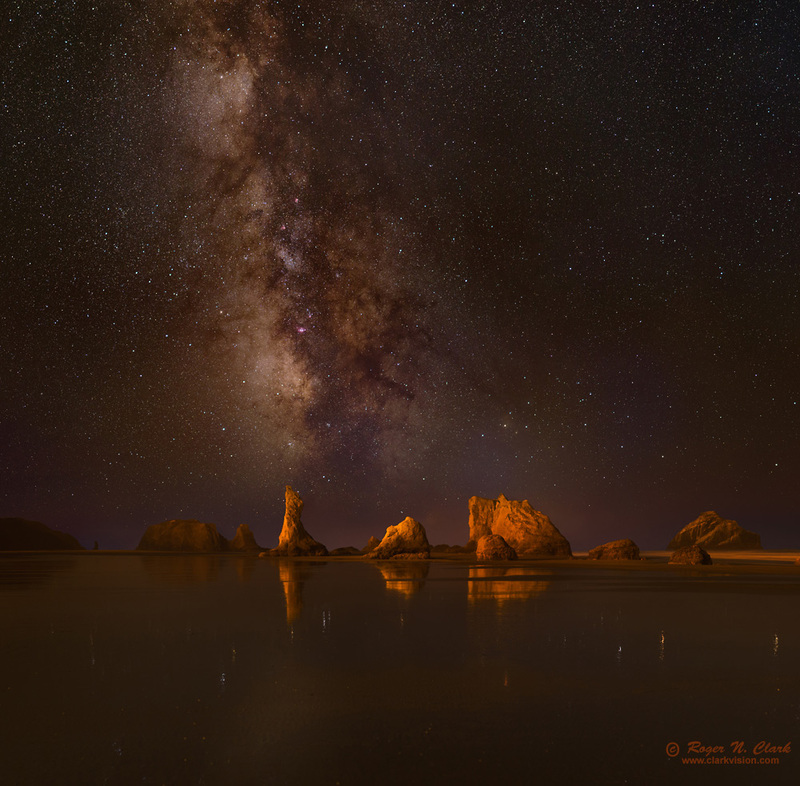 Bandon Oregon Nightscape in natural color. The colors were kept natural by properly using the curves tool in a photo editor to bring out faint details and subtract light pollution and sky glow. The light on the rocks is from the city of Bandon. Larger gallery image with more info is here. If you do a google search for how to make night sky images, you will likely come across many sites teaching how to make images like those in Figure 2a middle and right panels. I will hit hard in this article, because many of the photographers teaching these bad methods have done so for so long and produced so many blue images they do not want to acknowledge that their images are producing blue artifacts and unnatural color and even become hostile in discussions about color. Further, such teachings have become so common that many people think the natural color of the dark, moonless night sky, including the Milky Way is naturally blue. The Milky Way IS NOT BLUE in natural color. Photographers are certainly allowed to color their images any way they want for effect, even when it is not natural. I have no problem if those teaching sites would simply acknowledge they are producing such colors for a particular effect (e.g. mood) and acknowledge what natural colors exist in the night sky. But too many are insisting their images are natural. Further, some even insist the colors in images like I produce, which are verified by color photometry and spectral intensities, are the ones that are not natural. If you come across such sites, I recommend you steer clear. I am hoping my series on natural color in the night sky will change such attitudes and when they do, I'll change this article. Again, it is fine for photographers to color their images any way they wish for mood. But if the site does not discuss that the colors they produce are simply for a mood and not natural color, the author may not know what they are doing and actually believe they are producing natural color. Indeed, I encounter many sites like this. If you see such sites, please email the author and tell them. Be aware you might get a hostile response. I also want to acknowledge that photographers and astronomers also make images that are purposely not natural color, including infrared, ultraviolet, and narrow band tuned to specific emission lines. Such images are called false color and can also be beautiful. In my professional astronomical work, most of my images use infrared. Such images are acknowledged for their specific applications and not passed as natural color. This article is about producing natural color images of the night sky and avoiding artifacts from processing that make images depart from natural color. You can see examples of my scientific work using false color and narrow band IR in the Science section of this web site and in my Scientific Publications. There are many web sites teaching unnatural color night sky processing and conduct photo workshops and tours, teaching unnatural color. They argue that one can't see color at night, so we can color our images any way we want. Well, yes, everyone can color their images any way they want. But you can actually see color in the night sky. Next time you are out under a dark night sky get dark adapted by using no lights for at least a half hour. Part way in to dark adaption, you should see that some stars are red. Planets show color, like Mars is red, Saturn and Jupiter yellow. Bright stars like Antares are red-orange. Other stars appear yellow, white and a few blue-white. Use a pair of binoculars to make the stars out of focus and see how many colors you can see. A disk is easier to see the color than a point. If you are far from city lights in a dark sky and the galactic center is up (summer in the northern hemisphere), the galactic core appears yellow-brown to people with normal eyesight. The Milky Way was named for the color of milk many centuries ago. But milk back then was not the white pasteurized product we buy at the store today--it was typically yellow, not white. Use a small amateur telescope and more stars will show color. Brighter nebulae will also show color: pinks, greens and blues. Larger telescopes will show more objects in the night sky with color. Our eyes evolved with sunlight, and when relaxed and not biased by strong colors, we see a daylight white balanced world. Our color perceptions get skewed by the use of artificial lights, like tungsten, orange sodium street lights, and bright red flashlights. So, bottom line, I firmly believe photographers can color their images any way they want, but if they are teaching (including a web site tutorial), they should tell people what the natural colors are and how to process for natural color as well as their interpreted color. 1) Light from stars, nebulae, planets, comets and galaxies and other natural objects beyond our atmosphere. 2) Light from the glowing atmosphere (airglow) and aurora. 3) Light from man-made satellites and airplanes passing overhead. 4) Light scattered off of particles in the atmosphere from artificial illumination (light pollution from cities). 5) Absorption of light through the atmosphere. absorption increases toward the horizon, causing a yellowing and reddening of stars and other objects beyond the Earth. This is the same effect that makes our sun appear yellower/redder near sunrise and sunset. It can also redden light pollution from distant cities. The signal our cameras record is the ADDITION of the above 1 - 4 components and MULTIPLIED by component 5. If you want to produce an image of the night sky that has only component 1 or components 1 and 2, then components 2 and 4 (or 2, 3, and 4) MUST BE SUBTRACTED. Many sites teach a bad methodology of using white balance, which is a multiply, not a subtraction to remove/reduce the effects of components 2 and 4. 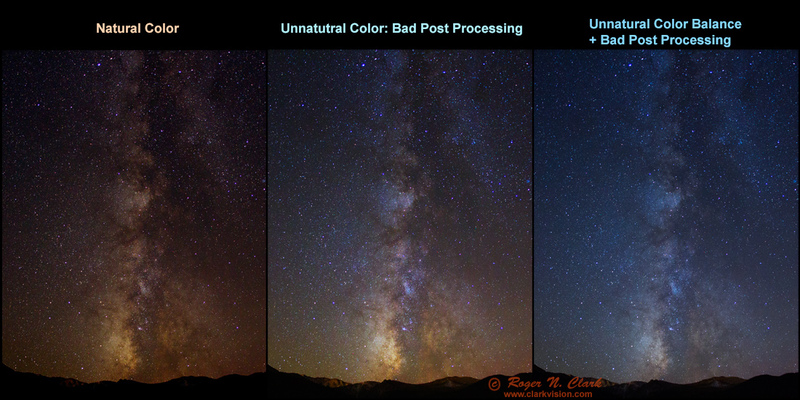 Part 3 of this series teaches better post processing methodology and subtraction of light pollution. This article is focused on the detrimental effects being widely taught, how to recognize it, and how to verify natural color in your night sky images. The basic problem of producing night sky images with natural color is a bluing that is caused by post processing by multiplication (color balance) to reduce effects of light pollution when a subtraction should be done. The bluing created by this process also enhances noise because there is little blue light in the dark, moonless night sky away from cities. Trying for force blue in a scene with little blue light enhances noise. Figure 2a. Different post processing methods leads to different colors. The left panel shows natural colors verified by star photometry. The middle panel shows color balance shifting with scene intensity causing an unnatural bluing as scene intensity decreases. The right panel used a tungsten white balance which made the image very blue to start, then methodology like that in the middle panel to further shift faint parts of the image even bluer. The middle and right panes are unnatural colors. The images in the 3 panels were made from the same raw file, a 30 second exposure made with an f/2.8 lens in moderate light pollution. Figure 2b. Example image processing with similar effects as in the night sky processing in Figure 2a. Left: natural color. Middle: blackpoint error causing bluing of darker portions of the scene. Right: Tungsten white balance plus the black point error as in the middle panel. Science or just good color practices? I have been accused of pushing scientific accuracy in night sky photos. I have made the distinction between natural color versus true color. A true color image of the night sky could be considered accurate color calibration with no contrast or saturation adjustments. Natural color opens the door for contrast and saturation adjustments, but keeps the basic colors as would be seen if the objects were bright enough to stimulate color response in our eyes. This also assumes normal vision and not color blindness. Red colors are kept reddish and not changed to blue or some other far-off color. Similarly for yellows, greens, blues and all other colors. I am not quibbling about the exact shade or hue, only that it is not wildly off as in the middle and right panels in Figures 2a and 2b. Figure 2b illustrates basic natural color of skin tones in a portrait versus bad image processing of similar magnitudes used by night sky photographers to color their Milky Way blue. If you make a portrait of a person, you do not need a rigorous scientific method for reasonably accurate skin tones. Most people would never produce images like those in Figure 2b middle and right panels, and they are obviously too blue for most people's tastes. Just a basic color setting was needed (white balance) to get skin tones reasonably natural. How close the skin tones appear to you depends on your monitor and its color calibration versus my color calibration (I use a color-calibrated monitor using an independent calibration measurement tool). For reasonably accurate color that most people recognize as close (especially if they know the person), I would call this natural color. Digital cameras make good natural color images with basic settings that photographers can easily choose in camera or in post processing of raw data. Using white balance to "correct" light pollution or reduce airglow is the wrong method and results in changing color balance with scene intensity. Light pollution and airglow are added light (the fog discussed above), so should be subtracted. White balance is a multiply: multiply the intensities in the red, green and blue channels using different factors to change which colors are brightest. But white balance corrections for light pollution and airglow do not produce a neutral balance--it just changes the color of the light pollution and the night sky beyond. It produces a bluing/purpling of the scene as intensities become lower as typically implemented (Figure 2a, middle and right panels). (The technical reason is because this introduces a black point error.) The key things in such images are the outer portions of the Milky way turn blue in images where white balance is used to "correct" light pollution. Depending on the severity of the light pollution, the white balance correction can result in blue to purple colors in the fainter parts of the Milky Way. Light pollution sometimes decreases with height above the horizon, so correcting light pollution with white balance can also cause a bluing/purpling of the night sky with height in the scene (Figure 2a, middle and right panels). All this is easily avoidable with better post processing methods. We learned in Part 2b) The Color of Stars that the majority of stars in the Milky Way are stars similar to our sun and cooler, thus redder. Around the galactic center, there are many yellow, orange and red stars and as the Milky Way fades into the sky background the color of stars remains similar and certainly does not change to blue. Also, the dark moonless night sky without light pollution is not blue; it is commonly filled with red and green airglow (sometimes yellow and orange airglow). One can see many star colors with the unaided eye, more with binoculars, and more with a telescope, but not the colors seen in night sky images where color balance was used to correct light pollution. Indeed, if we image a MacBeth color chart (Figure 3) that is illuminated by only light from the dark, moonless night sky away from cities, the color chart should have similar colors as illuminated by our daytime sun. (Part 2e of this series shows the colors on the chart using the daytime sun.) There are more yellow and orange stars than solar type stars in the night sky, so the colors will be slightly different with blues appearing a little darker. Indeed that is what is shown in Figure 3, and what I observed with my unaided eyes. Yes, those colors were visible to me. Relaxed with no artificial lights, our eyes have a daylight white balance. The colors in the chart in Figure 3 were close to what I observed. The darker colors, especially the dark blues appeared gray to me. The green appeared a gray green. The other colors were pastel versions of the colors in the chart. Even the dark brown in the upper left corner was visible as a brownish-gray. Note, the image and the visual observations of the chart were made around midnight on March 22, 2017 from the central Colorado, USA, Rocky Mountains at 10,000 feet elevation, so the brighter summer Milky way was not in the sky, only the fainter winter Milky Way, which was low in the western sky, and mostly blocked by trees. With the brighter summer Milky Way, the colors should be more prominent. Try it yourself. People with normal color vision can see colors at night. I also found that holding the color chart up helped add references, enabling me to distinguish more colors in stars. Figure 3. Image of a MacBeth color chart sitting on a car windshield and illuminated only by the night sky (example image of the overhead night sky). Color balance is daylight. Would you make a daytime landscape image with beautiful clouds, but block the clouds up to all white with no color or tonality? That is a mark of a bad landscape photo. So why do some professional and serious amateur photographers process night sky images to block up stars to make them mostly white (usually on a blue background)? Figure 4 shows differences in processing: left blocked up all white stars on a blue background, versus on the right, processing to maintain reasonable star colors. Stars do have color! Figure 4. 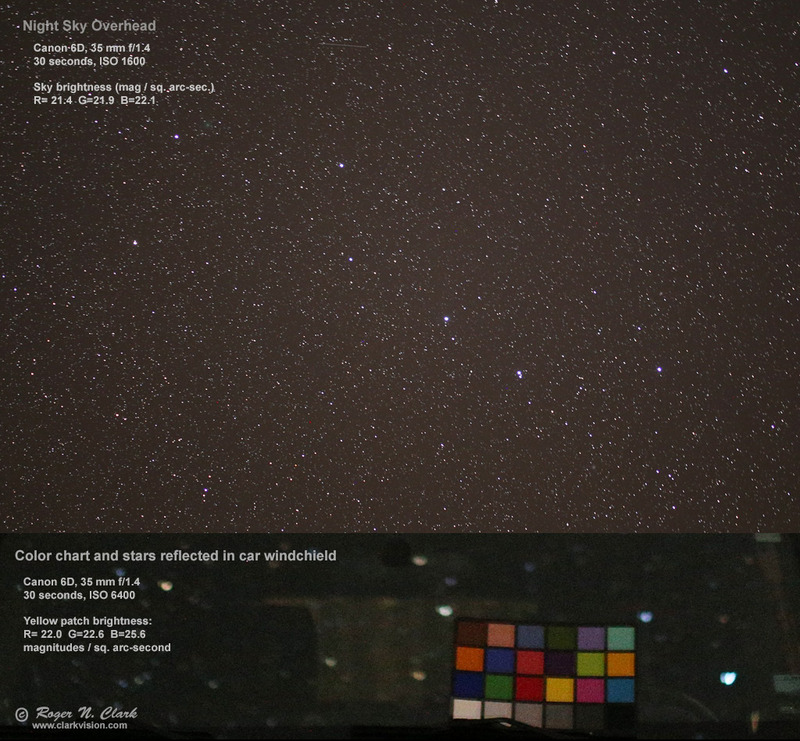 Comparison: processing to make a blue sky (left), with all white stars, or natural colors of the night sky with many star colors and nice tonality (right). The first step is to get a planetarium program that tells the color of stars. I recommend Stellarium (free, open source software). The color of stars was shown in Part 2b (The Color of Stars) to be well characterized by the B-V magnitude index. Extracts of Table 1 from Part 2b is shown below as Table 1 here which lists the colors with different B-V indices. The colors listed in Table 1 are the colors people with normal vision will see visually when properly dark adapted and observing the night sky with unaided eyes, binoculars and/or telescopes. Fewer than 1% of the stars in the night sky are blue; most are yellow to red. If you start Stellarium and click on a star, data on the star is shown, including the B-V index (Figure 5, left panel). Then look up the color by comparing the B-V value from Stellarium (or other star program) with the values in Table 1. The descriptive color from Table 1 should be close to what you observe in your images if they have natural color. Thus, verification of natural color is a simple matter of identifying stars in your image that are not saturated, and identifying those stars in stellarium and checking the color. Figure 5 shows the central part of the images in Figure 2a. The white arrow points to the same star in Stellarium, and the corresponding star in the 3 images from Figure 2a. The B-V of the star is 0.38. Looking at Table 1, we see that a B-V between 0.3 and 0.4 should be white to slightly yellow-white in the image if the image has natural color. Indeed, the panel in Figure 5 shows the star looks white (as white stars decreases in intensity, they will appear gray on the image). But the right two panels in Figure 5 show the star as blue, which is not the natural color of the star. You can check as many stars as you like, but check different intensities to be sure color balance is consistent with scene intensity. Figure 5. Checking for natural color is as simple as looking up the B-V value of the star in a program like Stellarium (left panel) and comparing the B-V to the expected color from Table 1 with the color in your image (right 3 panels). In this example, the natural color panel show a star color consistent with the B-V value. The right two panels show the star is too blue and not natural color. The blue color is an artifact of poor post processing methods. The star B-V value of +0.38 indicates a slightly yellow-red side of white. The Natural Color panel has color of red=181, green=177, blue=174, thus all within 4% and slightly on the yellow-red side, as expected. The 3rd panel from the left, labeled Unnatural Color, has red=195, green=230, blue=252, thus blue is brighter than red by 29%, so distinctly blue and not the color indicated by star photometry. The right panel has red=157, green=195, blue=232 so blue is brighter than red by 48%, thus quite blue and far off from stellar photometry. December 12, 1996 The Milky Way Through the Summer Triangle Film image, shows tan Milky Way in Cygnus. July 23, 1996 Hale-Bopp, Jupiter, and the Milky Way North of the galactic center. Film image shows the Milky Way as yellow-brown. June 5, 1996 Sagittarius and the Central Milky Way Film image. Galactic core is yellow and lots of orange dust. August 17, 1998 Comet Hyakutake and the Milky Way Reddish Milky Way and reddish airglow. November 26, 1998 Meteor Milky Way Film image of Orion region showing grayish airglow and red h-alpha nebulosity. 2001 June 27 Moonlight, Mars, and Milky Way The first bluish night sky Milky Way image on APOD, but it is blue due to moonlight and maybe twilight. 2002 September 23 The Milky Way Over the French Alps Film image but digital enhanced--the first Milky Way image stated as digitally enhances. The galactic core is yellow-white and color fades without shift to the background sky, but the background sky is dark blue. Antares is yellow. 2005 October 4 The Milky Way in Stars and Dust Yellow-white galactic core with orange dust. No color shift from galactic plane to outer portions of the Milky Way. Background sky is black. 2006 August 1 The Milky Way over Utah The first digitally enhanced image with the color shift away from the galactic plane. The galactic core dull white, M20 white. Only the brightest dust is brown-orange. 2007 January 23 The Milky Way Over Paranal Milky Way core is yellow with lots of brown-orange dust. No color shift to the background away from the galactic plane. Background sky is green airglow. 2007 May 25 Jupiter, Vesta, and the Milky Way Galactic core is yellow. Little color shift away from the galactic plane. Background sky is green airglow. Antares is yellow. 2007 October 20 The Milky Road The first APOD with strong color gradient in the Milky Way away from the galactic plane. Galactic core in yellow-white. Strong color gradient from blue horizon up to black. APOD caption calls it a "fantasy view." 2008 January 4 The Milky Way at 5000 Meters Galactic core is yellow. Lots of orange dust. Antares is orange. Small color gradient away from the galactic center toward blue. Background sky is black. 2008 May 3 Alborz Mountain Milky Way The first really blue Milky Way image on APOD. Galactic core is off-white, Antares yellow. M20 white. Brightest dust is brown, but all fainter parts of the Milky Way and stars are blue. 2009 February 19 Mauna Kea Milky Way Panorama (TWAN) Strong color gradients to blue. Yellow galactic core, bright brown dust and the Milky Way color shifts to blue away from the galactic plane. 2009 May 19 Sagittarius and the Central Milky Way Rust orange dust, no color gradients. Excellent processing by Robert Gendler. 2009 June 13 The Milky Road Strong color gradients to blue. Yellow galactic core, bright brown dust and the Milky Way color shifts to blue away from the galactic plane. 2009 July 29 The Milky Way Over Devils Tower Wally Pacholka (TWAN) Strong color gradients to blue. Off-white galactic core, some brown dust and the Milky Way color shifts to blue away from the galactic plane. 2009 August 18 The Milky Way Over the Badlands Wally Pacholka (AstroPics.com, TWAN) Strong color gradients to blue. Off-white galactic core, some brown dust and the Milky Way color shifts to blue away from the galactic plane. In this section, I will give some more technical details. Figure 6 shows the image used to produce the images in Figures 2a and 3, but before any light pollution was removed. The orange cast is due to light pollution from a nearby city. The white line is a traverse of image intensities shown in Figure 7. Figure 6. Image from Figures 2a, 4 before light pollution was removed. The white line is the traverse track and the intensities along the track are shown in Figure 7. Figure 7. Traverse of scene intensities along the track shown in Figure 6, from point A near the horizon, to point B at upper right in the image. The straight lines show approximations of the light pollution gradient in the image, and the intensity and amount of the gradient is different for each color. The skyglow intensities need to be subtracted in order to show the stars and Milky Way in natural color. The straight lines represent the blackpoint in the image. Note the blackpoint is different for each color channel and for each pixel in the image. The upward spikes are stars. Much of the up and down structure in the traverse is structure in the night sky and Milky Way, while some is also noise from the low light levels. The vertical scale is a 16-bit range, 0 to 65535, and the sky histogram peak on the camera LCD was at about 20% from the left to right. That means the sky data are in the linear regime of the characteristic tone curve (see Part 3b for information on this topic). The intensity profiles in Figure 7 illustrate the magnitude of the night sky imaging problem with relatively low light pollution. Note the solid lines labeled Blue Skyglow, Green Skyglow and Red Skyglow. The distance from zero shows approximately how much needs to be subtracted to reduce the light pollution to show the Milky Way and stars in the night sky in natural color. That large offset reduces the contrast in the deep sky. That contrast reduction is also why it is harder to see the stars in a light polluted sky: the added lighted reduces contrast below what our eyes can detect. It is the same with the daytime sky: the stars are still there in their same intensity, but the sunlight scattered off of molecules and dust in the sky is so bright that the contrast is too low to see the stars. By subtracting the light pollution, we can then amplify the remaining small signal from the stars and Milky Way to make beautiful images in natural color. If we multiplied the signals in Figure 6 and 7 (e.g. by applying color balance to make the image less orange), the light pollution is still there, just with a different color and mix, producing the unnatural bluing with different scene intensities. White balance is a multiply, so is the incorrect method to reduce the effects of light pollution. This also includes auto-white balance and other forms of histogram equalization. Anthony + 4 foot chair = 9 feet. Bob + 2 foot chair = 8 feet. The analogy is the empty chairs are the light pollution, and the people on the chairs are the stars, nebulae, and galaxies in the night sky. By the method used above, a multiply to equalize the chair heights, we could derive multipliers like 1.0 for Anthony and 0.5 for Bob. This way the chairs have the same normalized heights: 2 feet. (This what people do with night sky images: they make the red, green, and blue channels line up producing a grayer/bluer sky background by multiplying the intensities of each color channel. This is called histogram equalization. (Bob on chair = 8 feet) * 0.5 = 4 feet. So we erroneously conclude the two chairs have the same height, then Anthony is 9 feet tall and Bob is 4 feet tall! Obviously, a multiply is the wrong method, which results from the ASSUMPTION that the two chairs are of equal height (the analogy to make grey/blue sky from light pollution using histogram equalization). the correct heights of Anthony and Bob. So too with light pollution. It is added light, so subtract it. If you multiply, you get the wrong answer with detrimental effects. Here are three analogies, Figures 8a, 8b, and 8c. Each one is an image where the colors have been radically changed to something quite unnatural in post processing. Certainly these images create a different mood. I believe that photographers are certainly OK with creating any color scheme they want, just realize when it is natural and when it is a digital creation. Figure 8a. A beautiful red sunrise has been turned blue with post processing. 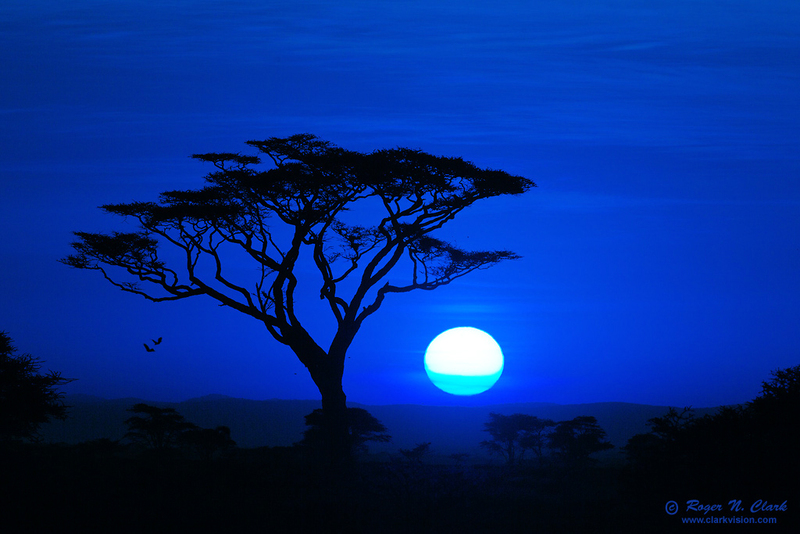 This is similar to the turning of naturally red night sky images blue. Figure 8b. Artificially blue night sky images? 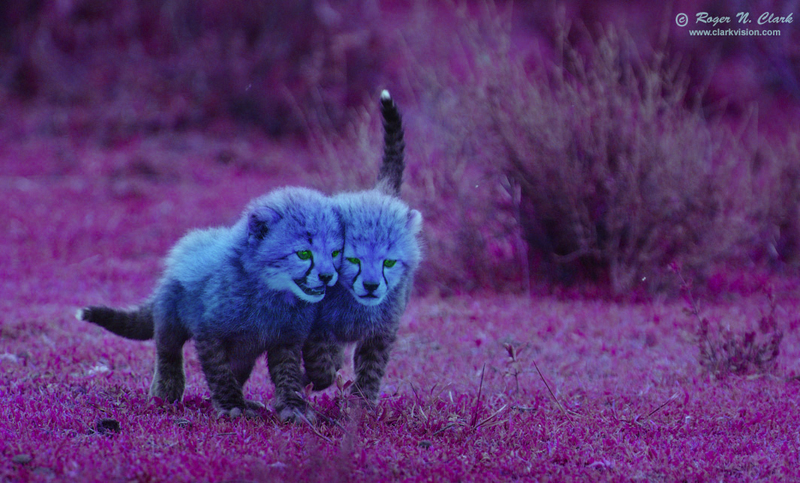 Why not blue baby cheetahs? Easy in post processing. Figure 8c. 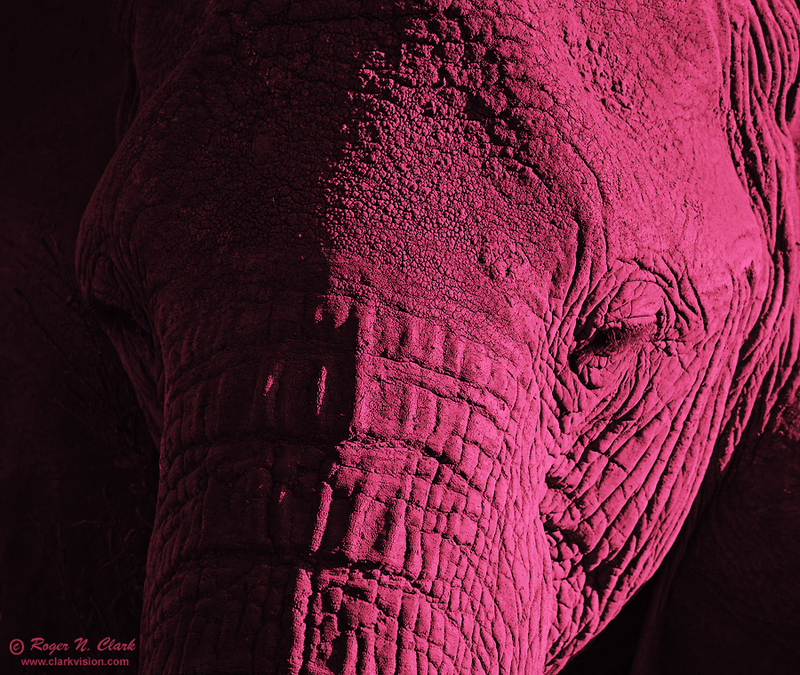 Hear of pink elephants? Easy, just make fake colors in post processing. Photographers are certainly allowed to color their images any way they want for effect, even when it is not natural. If it were a sunset scene and the reds were turned green or blue, people would likely understand it was not real. But many are not familiar with colors in the night sky and when they process their images are unaware of the artifacts producing the bluing. 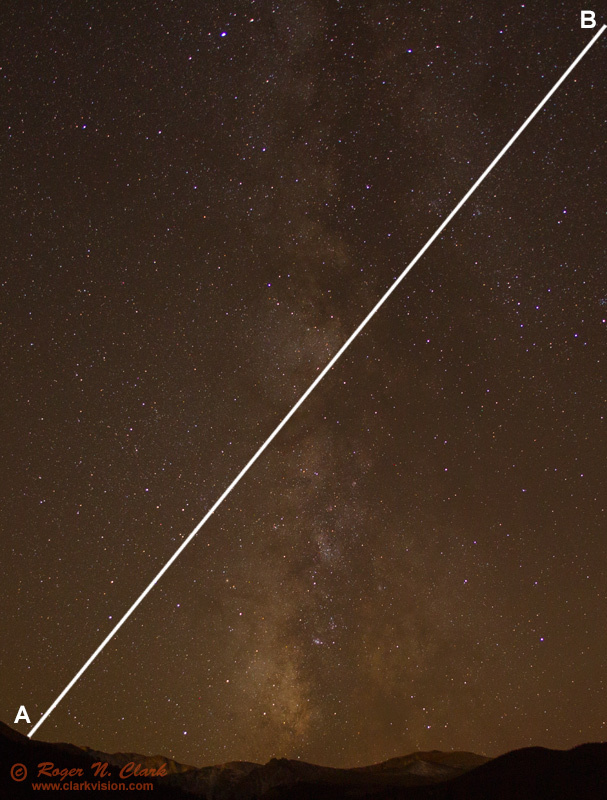 If you want natural color in your Milky Way and night sky images, DO NOT USE white balance, including auto-white balance to reduce light pollution. It does not reduce light pollution--it just changes the color. The Milky Way on a dark moonless night away from cities is NOT naturally blue. The Milky Way is full of beautiful colors, including red and pink emission nebulae, reddish-brown dust, mostly white to yellow and red stars, sprinkled with occasional blue stars, blue reflection nebulae, and green (due to oxygen) emission nebulae. If you use white balance to reduce light pollution, you'll turn too much of the image blue, hiding and suppressing the natural beauty of the night sky. For natural color, record night sky images with daylight white balance and use tools that subtract light pollution. I describe appropriate methods in the following parts of this series. Blue Milky Way images have become truthiness and an artifact in the digital camera age by people pushing a process that is destroying color. I'm fine with people coloring their images any way they want, but I object if they insist a blue Milky Way is natural, and I really object when they say my non-blue Milky Way images are wrong because they are not blue (yes, I get this often). I strive for a good representation of natural colors, and use a color-managed workflow on a color-calibrated monitor. For example, pick a typical daytime scene or red sunset scene and process it the same as you do astro images. The typical astro processing that is popular these days includes histogram equalization. 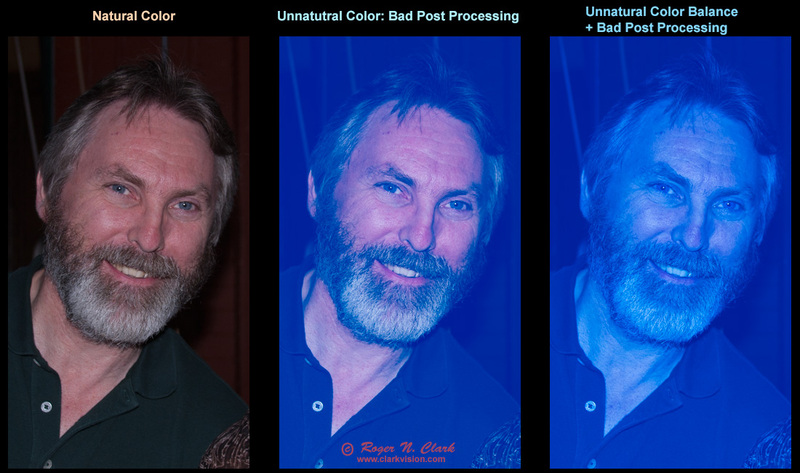 That is disastrous to proper color balance. Try it on a red sunset scene. I have. See Figures 10a, 10b, 10c here: 3c) Astrophotography Image Processing with Light Pollution . Note how the histogram equalization has turned red to blue! That is the source of a lot of blue in astrophotos--not natural at all. Processing that includes histogram equalization is a main reason for poor hydrogen-alpha response in digital camera images (hydrogen-alpha is the emission that makes some nebulae red). Most cameras actually have reasonable hydrogen-alpha response, and if people used a normal color managed work flow similar to any other image, the true natural colors will come out, including plenty of hydrogen-alpha. Start with daylight white balance. Jacoby, G. H., Hunter, D. A., and Christian, C. A., L Library of Stellar Spectra, The Astrophysical Journal Supplement Series, 56, p. 257-281, 1984. Spectra with corrections through May 2014. Article and data can be found here (for digital data follow the SIMBAD Objects link).